RAVEN and GIRLSCHOOL on one evening. That’s something you don’t wanna miss out on. Four ladies that have been named the sisters of MOTÖRHEAD and three guys that invented athletic rock. This is simply too good to be true. The location of this festivity is de Lakei in Helmond. A cozy place to be, which has parking space in front of the venue. The third band on the bill tonight is called HARMONIC GENERATOR. HARMONIC GENERATOR hail from France and actually, I didn't know anything about them. Now I do know, that their sound is comparable to bands like THE CULT and AEROSMITH to name but a few. GIRLSCHOOL can’t do wrong by me. 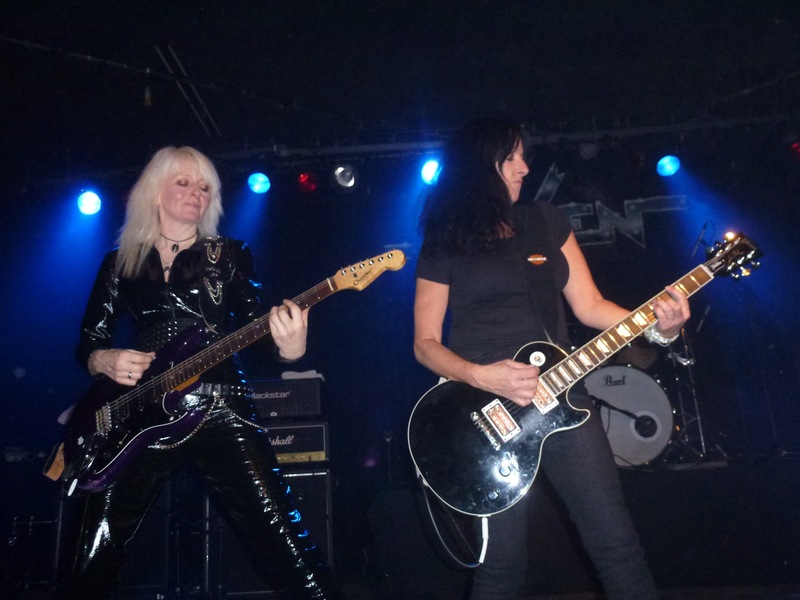 Their dynamic live shows are always high quality and these hard rocking ladies seem to never grow old. Wish I also could say that from myself. Going back to school is never easy, but for this school I’ll gladly make an exception, especially when seeing four lady teachers. On the program is a full hour practical lessons in heavy metal, taught by these four profs who have seen it all, done it all and have been there many times before. A master class you can’t say no to. When the four lady teachers enter the stage, it’s time to rock but pretty soon the first problem appears. The band starts with “Demolition Boys”, but very soon they find out that Denise isn’t ready yet and she’s still fixing her drum kit for the big job. With a little help from the roadies, things are getting organized and off they go again for a full hour of GIRLSCHOOL power. The beginning is difficult and after the first song, Denise is still struggling a bit and Jackie makes a silly joke that Denise is usually destroying her kit but now she’s trying to fix things. You’re not used to that. After “C’Mon Let’s Go” with a drum intro, all signs turn to green and the band is about to “Hit And Run”. A slow start, but the band makes up for that pretty easily. Jackie is dressed in a latex suit and a lot of guys are starting to salivate. I choose to stand on the right side of the stage, where Enid Williams is plundering her bass. Kim is standing right in the middle of these two ladies. “I Spy” has Enid on vocals. The fact, that Ronnie James Dio sang on this song, gets a very positive response in the form of some loud yelling. Oh, and Tony Iommi of BLACK SABBATH got to play a little piece of guitar on the studio version as well. Now the girls are on their own, but they make a very nice version out of it. “Never Say Never” is also a relatively new track among all the hits and classics that we get to hear this evening. “Screaming Blue Murder” is on next and GIRLSCHOOL are at full steam now (steaming blue murder) and with “Future Flash” we have come to the first highlight of the evening. A very energetic version unfolds itself and the reactions of the audience are heartwarming. “Kick It Down” is a nice surprise, but another big highlight must be “Watch Your Step”. Some songs are getting to you double as hard, when you haven’t heard them for a while and that’s certainly the case with this terrific song. “Yeah Right” is the perfect song to do some singing - well actually, it was more screaming, but you get the point. The GUN cover “Race With The Devil” is on next and the crowd is really going out of their mind right now. The only thing we still have to do after this song is to call 999 for an “Emergency”, caused by an overheated audience. By the last notes of this song, the public is in a state of euphoria. The average metal head shares my vision. GIRLSCHOOL can’t do no wrong. The only disappointment is, that I saw a wonderful white Flying V on the left side of the stage behind the curtains. It’s a shame to have a killing machine like that and not using it. But you can’t have it all. They also didn’t play as loud as before, but their sound was a lot clearer than usual, although I get the idea that it wasn’t that good on stage by looking at the expression on their faces. After going back to school, it’s time for some athletic moves to close the day. For those of you, who still have got some adrenaline running through their veins. It was at Keep It True, many years ago, that we met up with the band again. And I finally had the opportunity to do a long interview with bass player John Gallagher, who is also a Monty Python adept like me. The band still sets up their gear themselves for thirty-five years now. These guys have got that ‘Do It Yourself’ attitude and I’ve got deep respect for that. When the stage is cleared, the band takes a ten minute break to put on a clean shirt, brush their teeth, comb their hair and look good for their precious audience. Once they are on stage and the first notes come from the P.A, we know for sure that they are here to “Take Control”. Their sound is loud and it has got a terrible buzz from where I’m standing. But the band shows their first moves and it becomes clear that they are ready to rock the joint tonight. “Live At The Inferno” belongs to my list of favorites, but then again I must confess that I have many on that list. At the end of this track, John notices the strange buzz as well and takes care of it right away. The three musketeers continue with “All For One”, a song that really is autobiographical, no doubt about it. Like the three musketeers, they cross their swords - I mean their guitars - resulting in a whole lot of noise and a firm yelling of the audience. “Hard Ride” pleases many of the old fans, which was definitely the majority of the public this evening. It’s good to see that all these people are still so dedicated to their favorite band. “Breaking You Down” is a new track but it receives a stunning response. The motto of tonight is “Rock Until You Drop” and the rules of the game are explained in the next song. The title is also on the logo of the shirt of John, which carries the RAMONES logo with the names of the guys of RAVEN on it. Nice tribute to one of the best punk rock bands in the world. After that, it’s time for Mark to stand in the spotlights with a blistering guitar solo. According to some fans it was a bit too long, but the faces he pulled and the enthusiasm, he pumped the notes out of his guitar was really mind-blowing! These fans will be pleased with a good version of “Speed Of The Reflex”, in which we hear some of the early influences of RAVEN, namely the band RUSH. Just listen to the awesome yet too short mid-piece of “Tyrant Of The Airways” for example, which has got a very progressive touch. The next song “Mind Over Metal” gets the crowd moving again. On the right side of the stage, the band has a few female spectators. It looks like the ladies of GIRLSCHOOL had a good time watching their brothers of metal for a while. “Into The Jaws Of Death” continues and obviously the whole back catalogue of the band comes along, which mixes very well with their newer stuff. “Crash, Bang, Wallop” is a personal fave of mine and a very nice opportunity to let out some sweat at the end of this gig. And these guys sure did their very best to please everyone in the house! It was a real pleasure to watch them cranking out one classic after another. And the flow of classics went “On And On”, as the next title already suggests. Okay, I take another air guitar, why not? The evening is still young. Then it’s time for John to freak out. He takes the time to show his skills and his bass guitar rocks like hell. The seclusion of tonight’s show comes with a long version of “Break The Chains”. Like always, they play some parts of classic rock songs in this last song and this time is no exception to the golden rule. Every headbanger sings along to songs like “Caroline” (STATUS QUO), “Wheels Of Steel” (SAXON), “Rock Bottom” (UFO) and “Genocide “(JUDAS PRIEST). With this heavy metal jukebox hit mix we have also arrived to the very last song of tonight. A night, where two wonderful British bands teamed up together for a good night of feel good heavy metal with a very high retro level. Just the way we wanted it. It made me feel twenty again for a short moment. The next morning however, it felt more like seventy, but that’s the way it goes sometimes. At least, they can’t take this away from me! This is just what happens, when three musketeers invite you back to school. The bill of four excellent rock bands invited us to come over to Rotterdam for an evening of heavy rock. It’s always good to visit the Baroeg. Many great bands have been playing there over the years, like ANGEL WITCH, HAMMERFALL, VIRGIN STEELE, RAVEN, ULI JON ROTH and I could go on for hours here by summing-up some of these impressing names. I also like the down to earth attitude of the Rotterdam citizens. They know how to throw in a good party and prove is given here tonight. With PICTURE as headliner you can’t go wrong, but it will take a little while before they will actually hit the stage. Our afternoon starts with a nice get together with our good friend Mark Oosterwijk, a rocker from head to toe. It has been about a year since we last met him and that’s why there were a lot of stories to be told. And every story tells another picture….nudge, nudge, wink, wink, say no more. Another good reason to come to Rotterdam was the opening act of today. LOST IN SANITY from Tilburg has already built up a very solid fan base and slowly their star is rising. They recently published a so called bootleg EP and an official live DVD. The posts on several facebook sites already talk about an extraordinary female guitar player, comparable to our very own Eddy van Halen. This must be one hell of a hot opener! When the band kicks off with “Mrs Rock & Roll” we see female singer Patricia Boehm in a long dress with a white sash printed with black letters “Mrs Rock & Roll” on it. This better be good. No worries, because once she starts singing, I see the audience melting away. Her soulful raw voice is perfect for a little bit of rock and roll and she can really call herself ‘Mrs Rock & Roll’ from the first notes on. 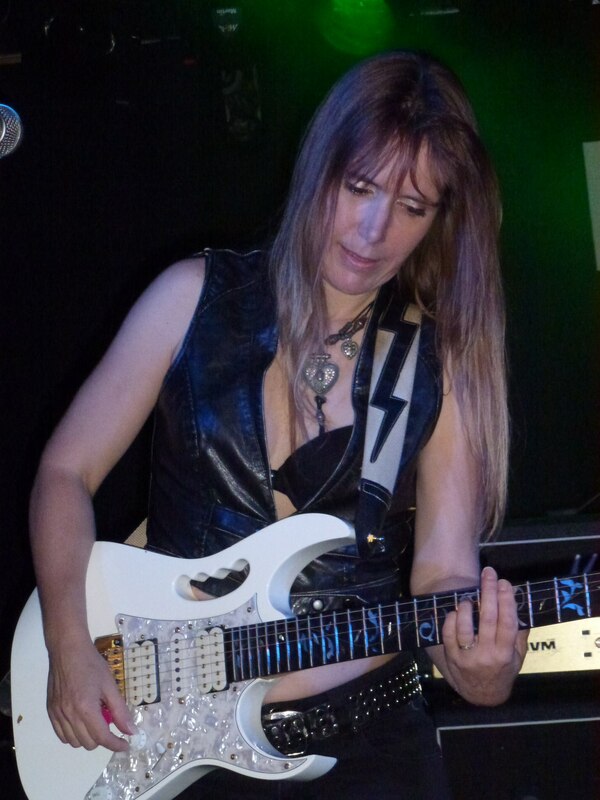 Oops, I forgot to mention Peggy Smits, the female guitar player. Once she gets to do her solo spot, I’m really blown away for a second time. Yep, this lady is indeed the female Eddy van Halen. “Got You In My Pocket” is therefore autobiographical, because the band has got me in their pocket in no time and the first switch of clothes by the singer has already taken place. She will do this trick two times more. Singer Patricia comes on stage with a white leather whip. I’m getting ready to be spanked. I didn’t know that this evil mistress of insanity would start the SM treatment that early. Yank me, crank me, but don’t wake up and spank me, momma!!! The mood and speed change during the refrain is a real surprise and I think that this is a true winner from the beginning until the end. What a killer track!! The band continues with “White Rabbit”, the JEFFERSON AIRPLANE cover (did I win something Patricia? Or did someone else already give you the right answer to the question, who wrote the original song??). Patricia doesn’t only sing this song, she also impersonates it. When’s she’s singing about being drugged by mushrooms, she also gives the public a funny cross-eyed look. Now that’s what I call a performer, which is a higher range than just being a singer to me. The guitar work sounds once again marvelous and I’m in rock and roll heaven for a moment and this is only just the beginning. “Changes” and “Feels Like Home” are on next and the no-nonsense attitude of the band is starting to work. The crowd is eating out of their hands. They start moving around and react to every comment given on stage. After “Feels Like Home” another clothes change takes place and a short dressed blonde haired diva arrives on stage for “Blow Me Away”. Soon it will be clear why this song is called that way. At the beginning Peggy stands on the big blower in front of the stage with her hair blowing in the wind cooling down her guitar, which is necessary. When Patricia makes her way there, she looks very much like Marilyn Monroe and she constantly has to prevent her skirt from flying high in the sky. A magical moment, my friends for those who’ve missed it (you silly fools!). Next is a love song, which has a bit tongue-in-cheeck description though, but we get the point. It’s all about “Money” and Patricia has got a lot of it and she hands it all out to her fans. A really nice gimmick and a lot of bands can learn a lot from small gimmicks like that, which keeps the listener focused. If they weren’t already for this magnificent band. After “Bad & Nasty”, which is a fine description of what this band is all about, we hear another rock classic of the highest region. They give us their very own version of AC/DC’s “Whole Lotta Rosie”, an exciting and slower version, which went down real smoothly. They really give it a twist of their own and when you’re not familiar with this song, you could be mistaken and you wouldn’t recognize it at first. With “Mine All Mine”, we have come to an end of tonight’s show. Amazingly to hear so much talent. Not only the ladies, but also the guys in the band really know to impress everybody. After the show we get the chance to say ‘hi’ to guitar wizard Peggy who sounds very enthusiastic. She blew us away with her mighty performance and LOST INSANITY belongs to one of our favorite Dutch rock and metal bands from now on and that’s a promise we will definitely keep! The three remaining bands don’t have any ladies in their line-up, so here’s a very short version of what they are all about. 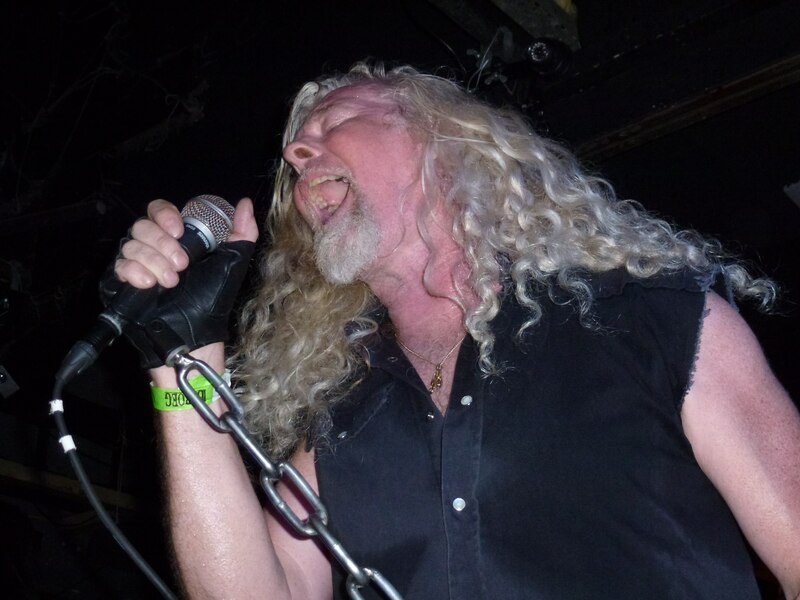 CELL 29 plays covers of OZZY, STEPPENWOLF, EUROPE and RAGE AGAINST THE MACHINE to name a few. They try real hard, but it just didn’t get across by yours truly. I do believe, that these guys are talented, but they simply don’t impress me. When they play some kind of loud version of a song from the soundtrack of “Grease”, I have the feeling that I’m at the wrong concert for some reason. LEAD BALLOON gets me moving. I know Robert Soeterbroek for a long time already as the singer of AYREON and he knows how to impress me pretty easily. When he starts the show with DEEP PURPLE’s “Burn”, I know we’ll get to witness a full hour of classic rock songs, straight from the heart of a true rocker. BAD COMPANY’s “Rock Steady” continues, it’s so great to hear this song again. Robert’s voice is in good shape and I like his kind of humor. It’s also a nice surprise to hear LED ZEPPELIN’s “Good Times, Bad Times” again. This also remains a great song. “Highway Star” of DEEP PURPLE is on next and especially the keyboard player asks for some special attention here. Then a surprisingly good tribute to URIAH HEEP follows with “Look At Yourself”, “Easy Livin’” (of course) and “Gypsy”. What a great choice of songs! The ‘yeehaw’ moment comes from “Sweet Home Alabama”, which is very well-known from LYNYRD SKYNYRD. Another moment of LED ZEPPELIN appears with “Rock And Roll”, which sums up the feeling that you’ll get after hearing this. The odd one out (maybe) is a song from THE ZOMBIES, which we all know from SANTANA with “She’s Not There”. Have another good listen to this song while reading these lines and I guess you’ll be impressed again by so much loud guitar work. The end of the set slowly comes near with another DEEP PURPLE classic, called “Black Night” and this mighty fine performance closes with “Can’t Get Enough”, originally recorded by BAD COMPANY. And again the song title really reflects the feeling that I get of this gig. He could have played the two songs, which were on his original set list (“Allright Now” and “Smoke On The Water”) for me as well, but it’s time to move on to headliner PICTURE. It will be the first time, that we get to see PICTURE with the new guitar players. I know that they won’t like it, when I say that I think that Jan Bechtum is and will always be the ultimate guitar player for PICTURE. Nothing will ever change that feeling. Having said that, I also must admit that “Warhorse” has been the finest PICTURE album in years. Well, I came to enjoy a good rock show and I knew upfront that PICTURE wouldn’t disappoint me. And they didn’t. They opened with “Griffon’s Guard The Gold”, and continued their set with awesome tracks like “Message From Hell” (originally recorded as a demo by HAMMERHEAD! ), "Eternal Dark”, “Lady Lightning” and the ballad “You’re Touching Me”. It’s a long time ago since I’ve heard that song. The audience is getting wild and excited and I see some familiar faces jumping on stage several times to honor their heroes. This is going to turn the hall into one big happy family with “My Kinda Woman”, the new “Warhorse” and “You’re All Alone”. It’s good to hear that this new line up continues to grab back to the old stuff and mixing it with the new songs. “Heavy Metal Ears” is a classic from the book of PICTURE, and after “Rejected”, we’re in for a nice surprise with “Unemployed”. “Battleplan” is another new song, while “Diamond Dreamer” leads us to “The Blade”, which is in my opinion one of the truest heavy metal songs of the band. “Bombers” has always been something special and this time it’s original bass player Rinus, who disappears into the public to share his bass with the fans in front the stage. That one bass move makes the man unbeatable and the fans are waiting for that special moment to come. It’s magic and with this track PICTURE closes their set, but not without being called back for an encore. The new “Shadow Of The Damned” is on first and “Make You Burn” is really the last song for tonight. I’ve had a wonderful time at De Baroeg. Can’t wait to be there again soon! Visiting Belgium is always nice, because it’s a beautiful country and they still have the true heavy metal spirit. Even the smallest cafes or clubs create a little stage, invite a band over and have one helluva night. That’s the way to do it. After arriving in Nazareth (near Gent, where we stayed with our friends Eddy and Christine for the weekend, we travelled on to visit one of the greatest metal stores in the country, the Pop Center in Kortrijk. I know this isn’t meant to be a commercial of any kind, but if you are a real hard rock or heavy metal fan, please do yourself a favor and visit this awesome store in the center of Kortrijk. It is situated opposite the Media Markt. They have a valhalla of cd’s, dvd’s and vinyl and a collection of ‘must have’ stuff, that is more than amazing. So go there, if you are searching for that one item, you’re looking for or just to have a good time. You won’t be disappointed, that’s for sure! Pop Center, remember that name! From Kortrijk we travelled on to Ieper and paid a visit to the Tyne Cot Cemetery (which was very impressive indeed! ), among some other interesting sights. We also watched the Last Post ceremony at 20:00 hours, before we took off to Eernegem to see TYRANEX play at the B52. 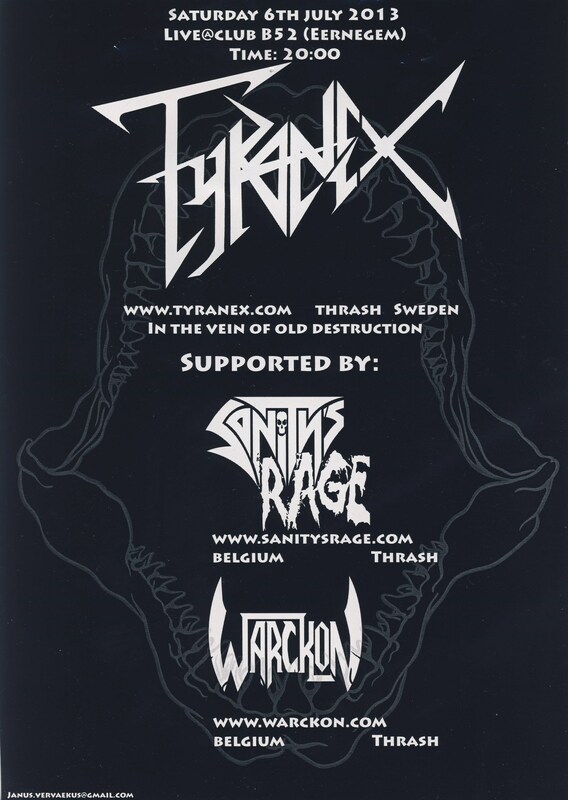 However, before they hit the stage, we were treated to two Belgian bands, namely WARCKON (raunchy thrash metal with a bit of melody) and SANITY’S RAGE (loud thrash metal). This last band seemed to have some good musical ideas. After almost forty minutes, they have to clear the stage for TYRANEX. Just for the record. There is one guy, who stands up for three bands in the underground scene. He books them for a night of thrash metal and although not too many people show up, those who did got to see three bands for a fee of just seven Euros. At the side entrance there’s also a stall with cd’s and vinyl records to browse through during the break. 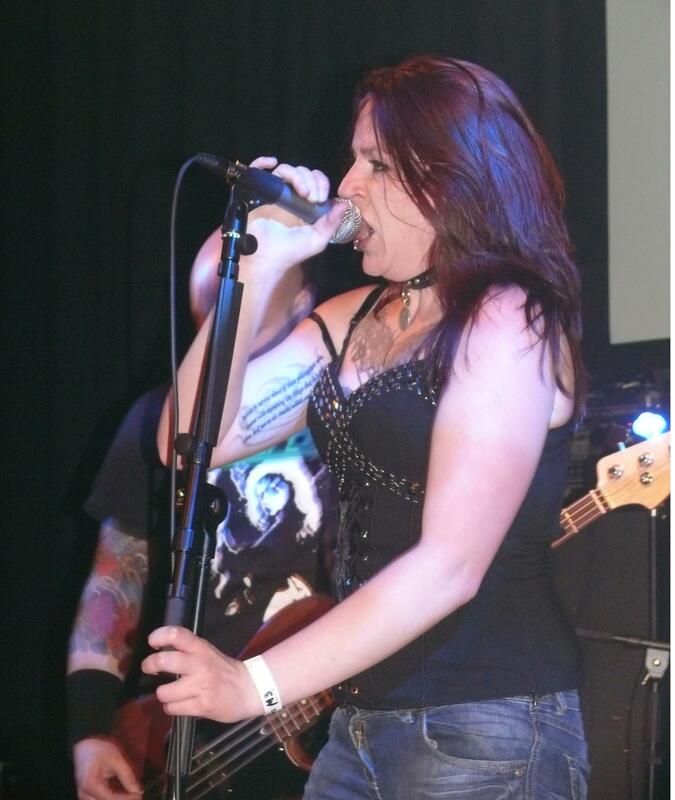 TYRANEX are a hot band in our book and we already spotted leading lady Linnea Landstedt on the side of the stage. She looks a bit shy. You wouldn’t say, that the devil is inside her, but once she gets out on stage, the evil side of Linnea reveals itself and she becomes the root of all evil herself. The transformation happens when putting on a black shirt instead of a white, some spandex trousers instead of jeans and a leather jacket full of studs. The sound check is LOUD and for a moment we think, that Eernegem will be wiped off the map tonight, but a disaster stays out. With “Weak”, they start their show and I’m focused again right away. 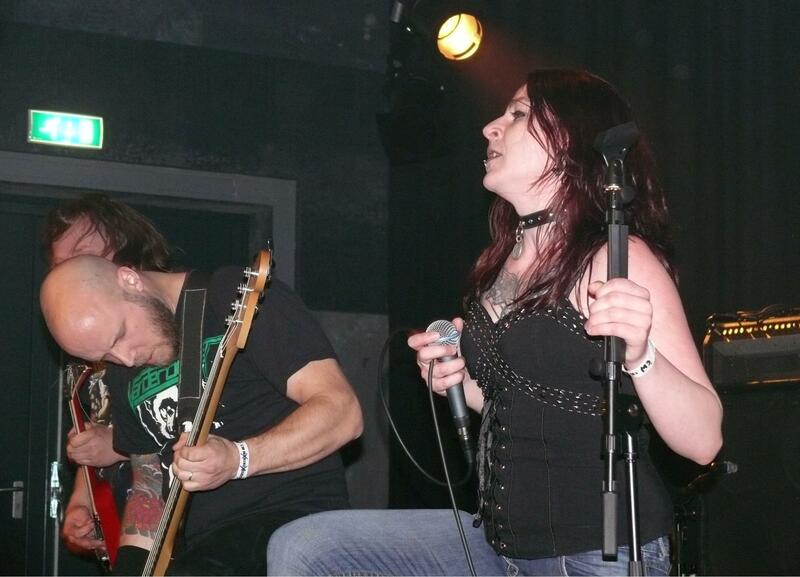 Linnea doesn’t only know to spit out her brutal lyrics into the mike real heavy, but she’s also a great guitar player. Her partners in crime are Per Lindström on bass and Johannes Lindström on drums. For a moment I am in “Dreamland” with this blonde vixen, but not for long, because soon she is “Awakening The Dead”. 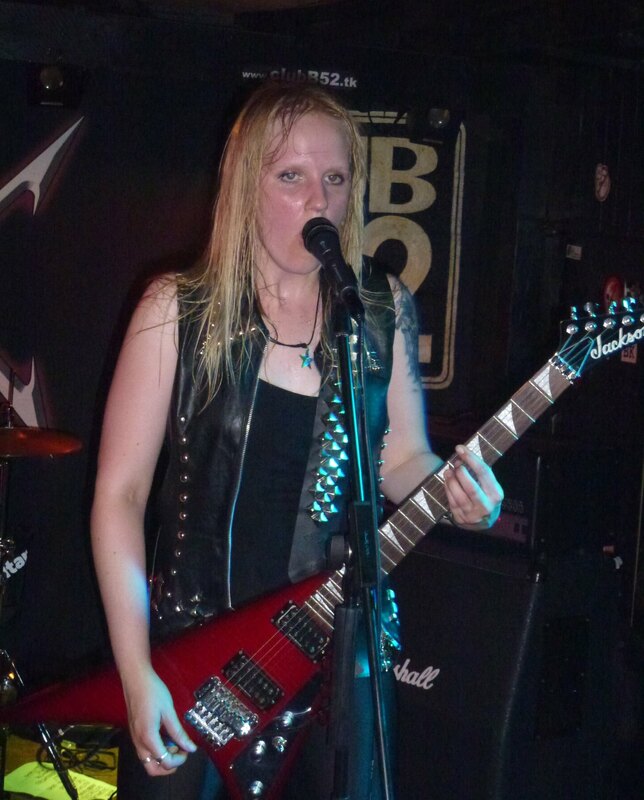 Her fiery guitar work is really a great addition to the fast, brutal thrash sound earlier tonight. “Victims” and “The Curse” are on next and just when you think that they can’t get more extreme than that, they turn it up a notch again and astonish you with a great dose of brutal bashers. “Wasteland” and “None So Cruel” follow and I must admit, that you can also sense some eighties heavy metal influences at times. However, most of the time the songs are speedy and thrashy and really loud. Eernegem is undergoing a little earthquake and I know what caused it. “Unable” is on next and after that the “Extermination Has Begun”, which is a true statement. Then it’s time to sing along to a track called “Tormentor”, which is definately my personal favorite of tonight. With “Blade Of The Sacrificer”, TYRANEX closes their set. And with this song their small European tour has come to an end and they will return to Stockholm. Hopefully, they will record some new material there soon. After all, their album “Extermination Has Begun” already goes back to 2011. And although it wasn’t too crowded, the people yelled for more loud enough to receive an encore. TYRANEX closes their show with “Splithead”. That’s what you get, when they violently put an axe into your skull. Sick and beautiful at the same time. Mostly you’ll see long haired, bearded frontman to impress you with sick, brutal lyrics, but tonight we are being attacked by a platinum blonde Swedish vixen, who introduced us to her evil twin sister. What a powerful show! I think, I got TYRANEXed tonight and it feels like heaven (read: hell) on earth. Thanks to Eddy and Christine for taking us to the middle of nowhere in Belgium and for TYRANEX and everybody at Eernegem for putting up a great show here. On the television tonight there's an old episode of BBC’s Top Of The Pops from 1977, in which they show a video clip by GARY GLITTER. There was a lot of controversy going on afterwards. However, we will miss this particular episode, because there's something happening in Leerdam and so we hit the town for a change. In Lucullus later that night, we have two GILGAMESJ guitarists teaming up in a blues cover band (nice gig, guys!) and in M3, which is a rather new venue, there’s a festival that goes by the name of Cultuurshok. On this festival we noticed the name of BLIKSEM, a Belgian metal band, that we really want to check out. At first, it’s a bit unclear where exactly this festival is located. We had to be at the entrance next to the soccer’s hall of Leerdam Sport. It’s still early, but to our surprise there are already a few more people inside. BLIKSEM are third on the bill. During the first bands we’re able to have a short chat with Koen, another die hard metal fan from Leerdam and who we haven’t seen for a long time. We also spot hardrock veteran Arie Piet Bogerd, who enjoys being in the front rows and let it all go. Then it’s time for some action with BLIKSEM. After playing many festivals and gigs in the Benelux, it’s our turn to check out this band from Antwerp area. 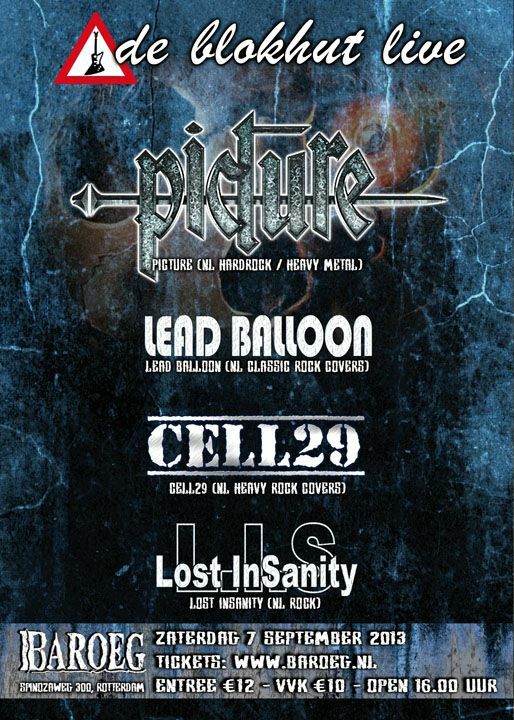 This evening we are about to witness seven tracks and a very powerful live show of these Belgian metallers. Front lady Peggy Meeusen has got a powerful voice and shows a lot of energy. The band spits out one heavy riff after the other, starting with the first track from their self-titled debut EP, “The Horror”, which is also one of our favorite songs from this disc. Definitely the perfect opener for a live show. The band is preparing themselves for a follow up to this album, which will probably see a release at the end of the year or something. “This Time” and “Disciples” are on next. I don’t know, if these are the exact titles, because they might have shortened the titles down a bit on the list. Anyway, we hear a heavy mix of some very thrashy riffs, which are highly influenced by the many bands from the San Francisco Bay Area scene. If you take the vocals of Peggy into account, a name like TESTAMENT comes to mind most of the times. Which definitely isn’t a shame to be compared with. “Follow” and “The Life On Which I Feed” are the next in line. It shows, that the guitar players make a great team and some solo parts are rather impressive. Both songs are taken from the aforementioned EP, by the way. The crowd seems to enjoy the show as well and Arie Piet and one of his mates are having the time of their lives in front of the stage. Sometimes I see more spontaneous interaction by other visitors, because they simply have to move along to the music. I didn’t see that before by the two previous acts, so BLIKSEM definitely makes the difference here. “Face The Evil” is another unknown track, which might be on the upcoming album. The last track, that we get to hear, is by far the best of tonight, next to opener “The Horror”. It’s where the instrumentalists show their skills in a rather lengthy version of “Circus Schizophrenia”, which is completed by a long instrumental mid- piece. After that, the fun is over and BLIKSEM thanks their audience for being here. After a short chat with Peggy, we decide to move to the other side of town to watch the mini reunion of the two guitarists of GILGAMESJ. We get a third guitarist for free, but he’s only in the audience and not on stage. This venue is much better attended, but I must admit that I really liked this new venue M3. There could be so much more bands playing there and bigger names as well. But tell me, who would be interested in getting over some NWOBHM bands to play for old time sake?!? BLIKSEM struck us by lightning and I’m happy to see, that this Belgian band is ready to take another step forward on the ladder to success. Well done and hopefully we’ll see more action like this in M3.